Ankara is one of the most fashionable African prints. Yes! it's also one of the most accepted. This post will give you classy ideas on African official wears. There was a time in the fashion world – long.. long ago. During those days, ankara dresses were only meant for the 'not-so-glamorous' outings. What of weddings? Probably not! Nigerian women of those days got some real.. love for laze prints. But then, don't blame them! Remember that gorgeous lady in Ankara Peplon? Ankara short gowns are classy. What more, you can even jump in Ankara jumpsuits. Now, with a vast array of new and beautiful Ankara office wears designs, come transformation in how Ankara dresses are accepted. What more ? Ankara has gone corporate. 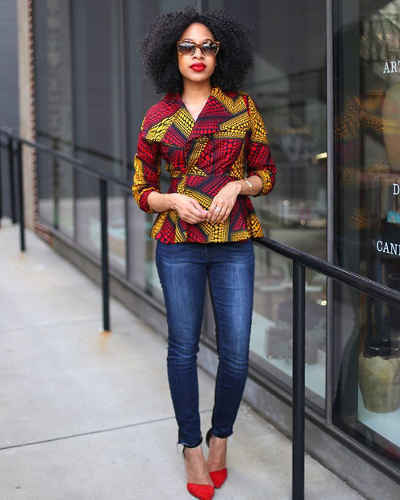 Many top Ankara styles for men and women are now suitable for work. Now, if you intend to click jaws and set many eyes rolling with when next you step in your office, we've come up with great ideas for you! 1. Ankara jacket on top of a black leather skirt. 2. 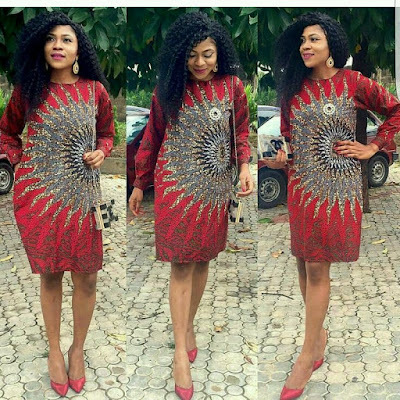 What of this lovely Ankara Peplon gown style? Off the mark? Not completely! Bomber jackets – and even ankara blouses are slowly creeping into the corporate space. 5. Think of this Ankara shealt dress.